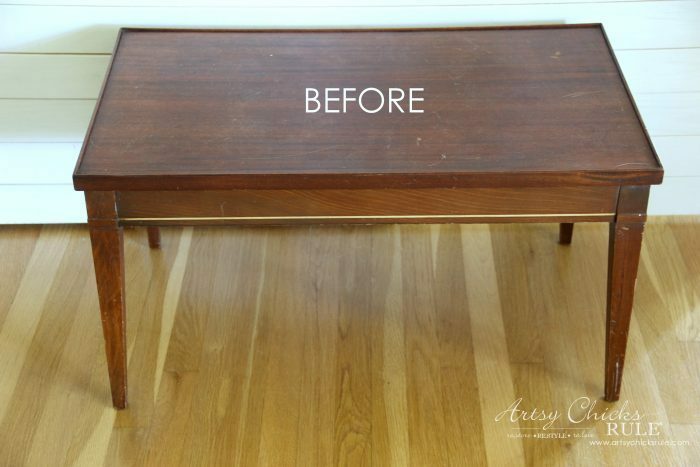 Step outside of the box on your next furniture makeover! 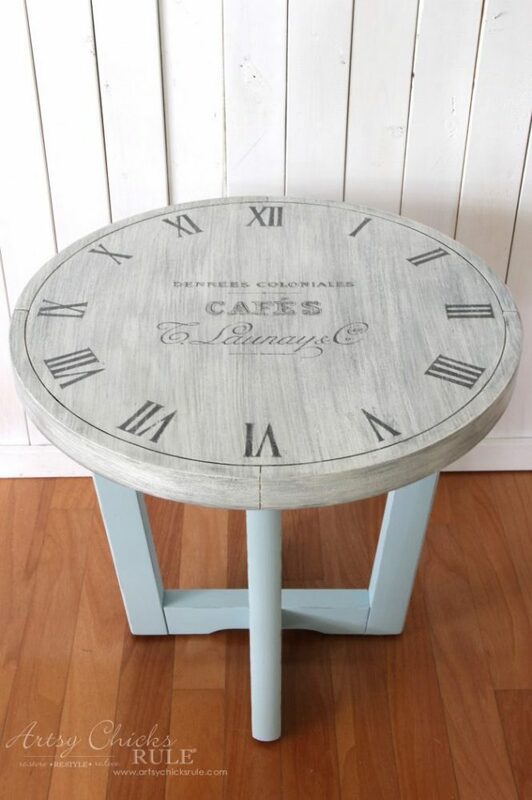 Like this French country clock face table. Nope, but it could be. 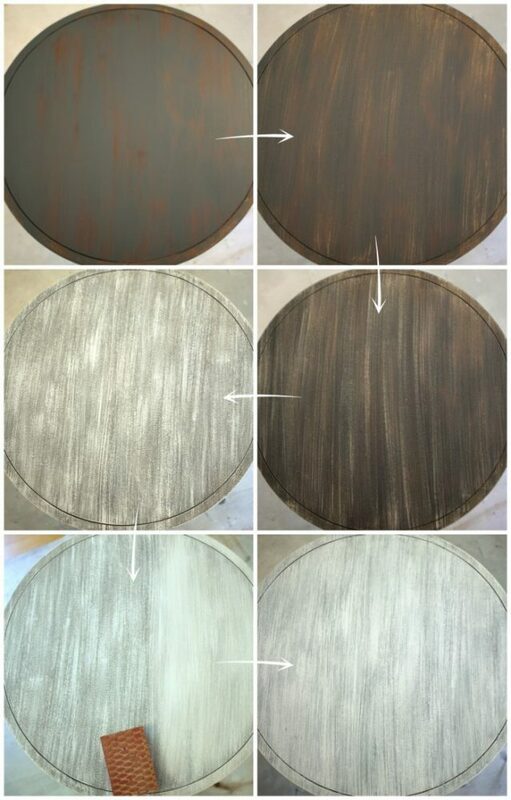 It’s actually what I would just call, simply, French Country…..and it’s a clock face table makeover, by the way. It may not be the typical “French Country” but it’s what I see when I look at it. 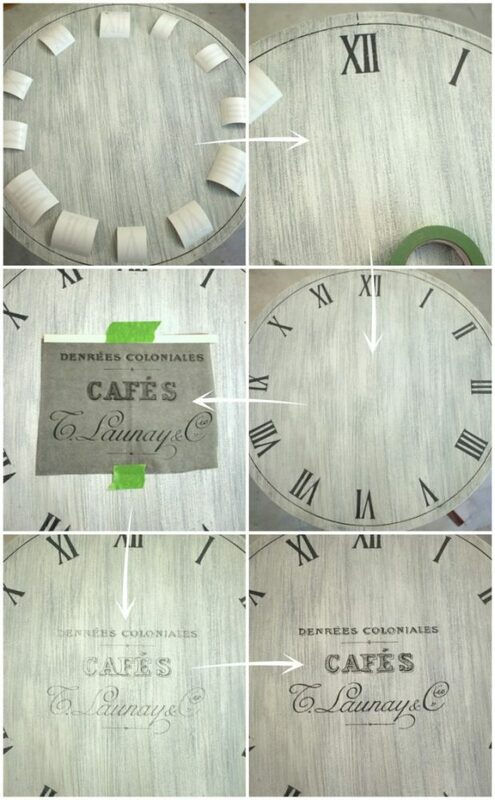 French country clock face table…. Not so much to look at, huh? But I loved the round shape of it and immediately thought a clock face would look pretty cool there. 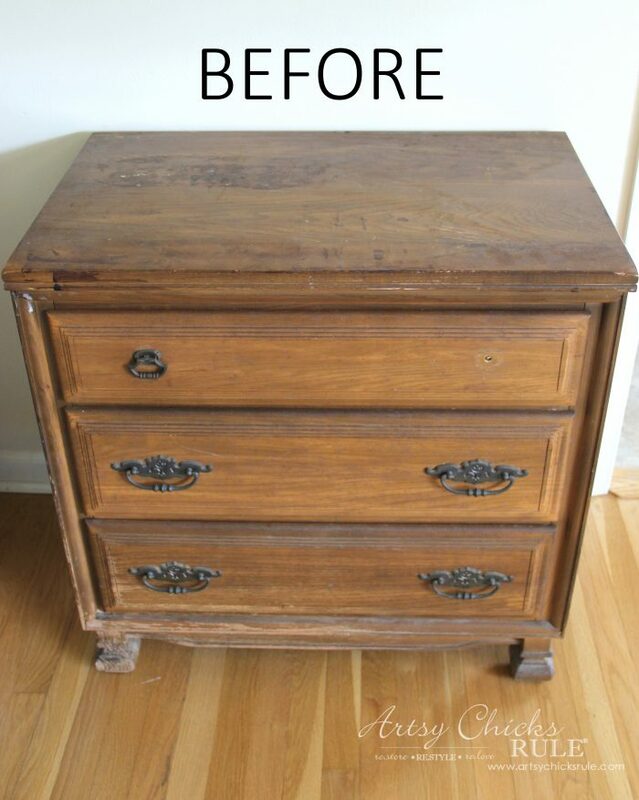 My original plan was to sand the entire wood top down and stain it with an antique walnut and then give it a heavy whitewash. But as things sometimes go….. So I brought it in and re-stained the sides to match. I probably didn’t need to do that but for what I was thinking I would do, it would need to match. In the end, it didn’t really matter. You’ll see below. 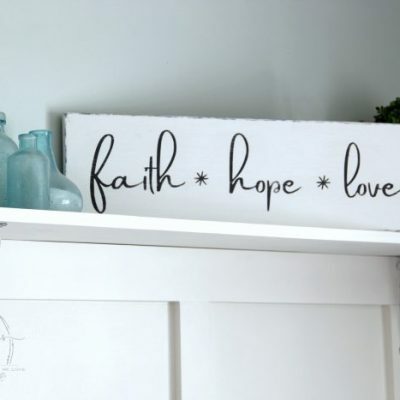 I instead gave it a layered paint effect to create the look of whitewashed, weathered old wood. Similar to these print frames I did the same to. I’ll include affiliate links to the products I used when I can below. There really is no right or wrong way to do this. Just layer them as you go. I added a lot of white at the end because I wanted it quite light. You can add more or less to get the look you are after. As you can see above, once I had finished the layering of paints, I used a sanding block to blend and soften the edges of all of it. Then I applied one coat of poly sealer. 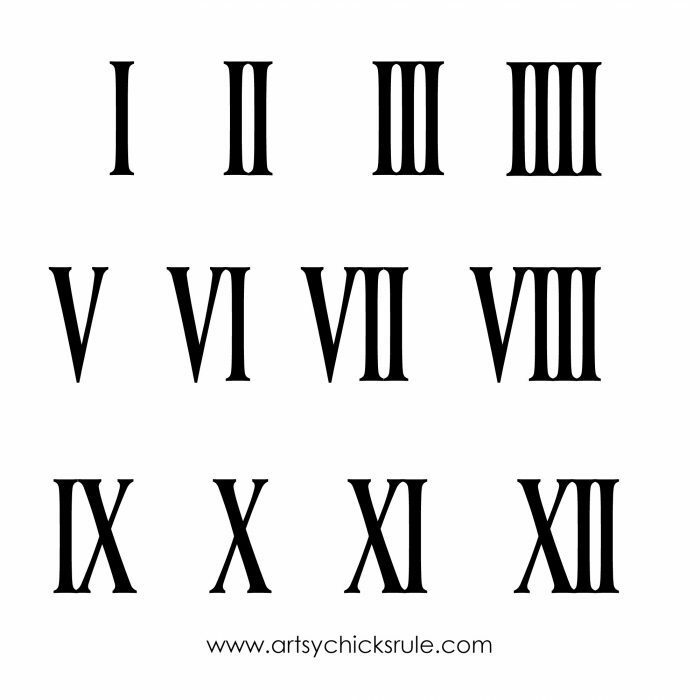 Next I created these Roman numerals in Picmonkey….. I then used my Silhouette Cameo to cut them out. I love using the Silhouette this way as it makes transferring graphics so much easier. I printed/cut them out and then cut out each Roman numeral to be used as a stencil. I went around the entire circle attaching the vinyl adhesive ‘stencil’ I created for the numerals. Then I used this graphic for the center. 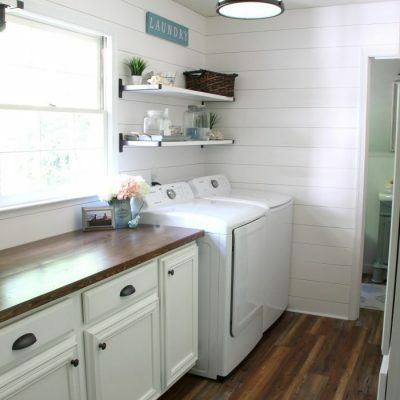 You can see all of my favorite transfer methods in this post, here. 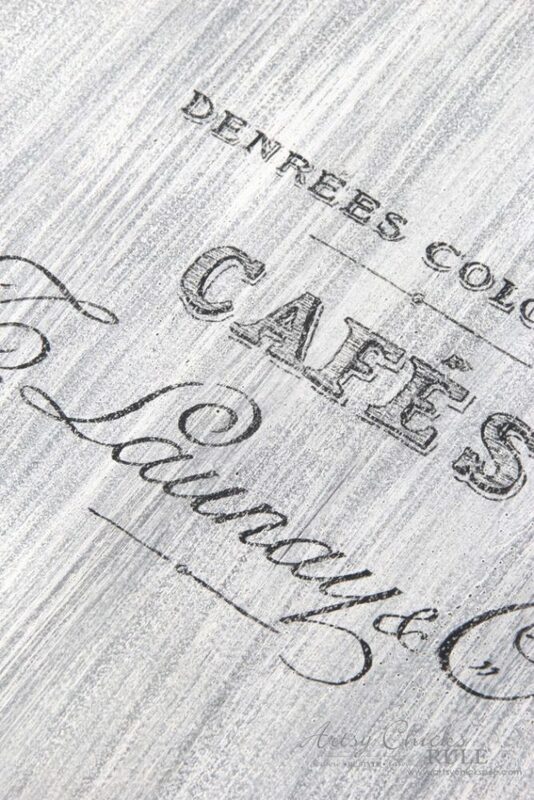 I hand painted the French graphic in using the Graphite Chalk Paint, the same as the Roman numerals, with a script liner brush. 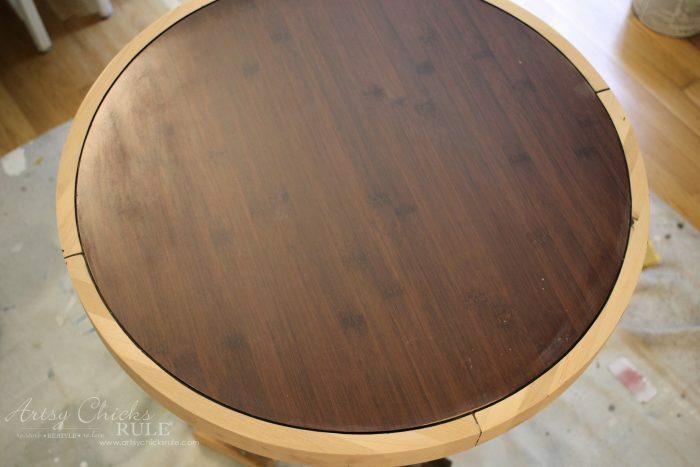 I then gave the entire top a very light sanding to distress and soften all the edges. I applied one more coat of poly to seal and protect the additional paint and graphics. The base is painted with one of Amy Howard’s paints, Nottoway. 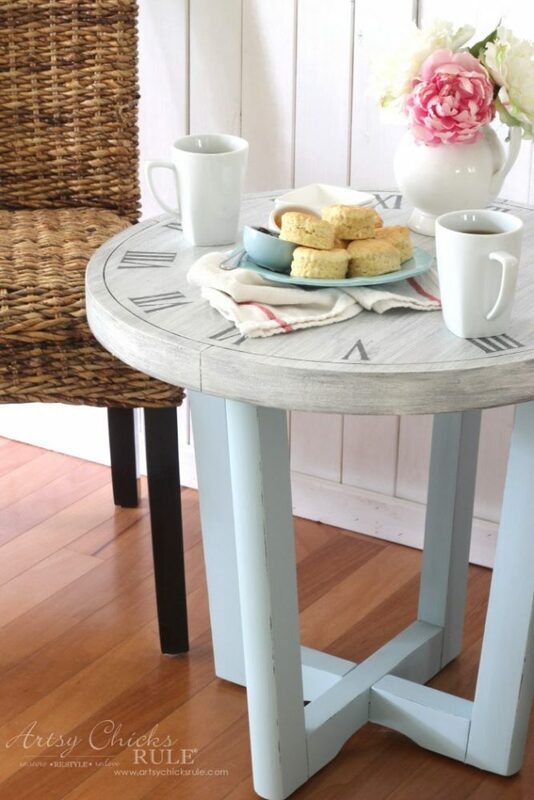 It’s a really pretty, soft blue that I also used on this table. I also distressed the base just slightly and gave it a coat of poly for added protection. 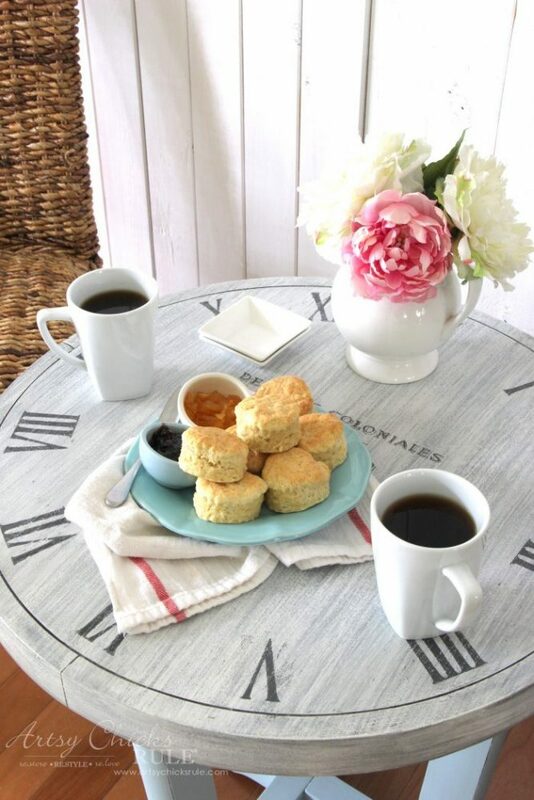 I know, it’s hard to focus on the cute little table when I’ve got fresh baked biscuits and jam staring you in the face. And who knew we were getting biscuits today! I sure didn’t when I started out this morning. 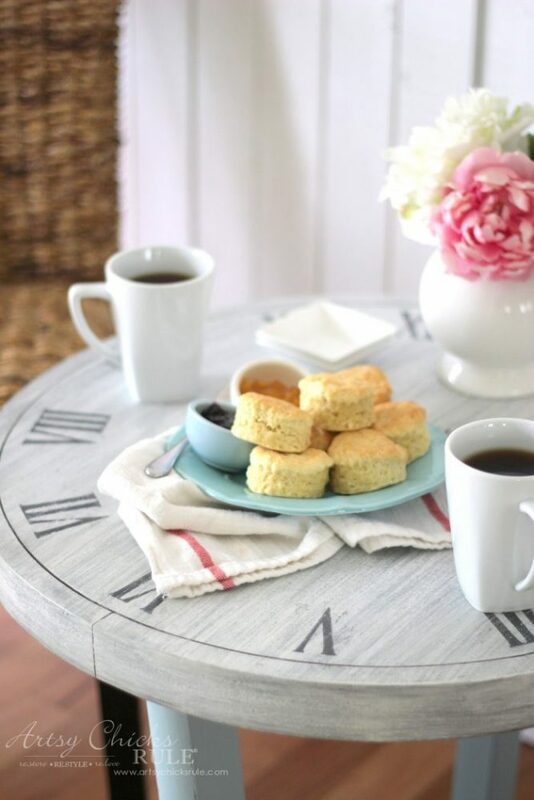 PIN this French Country Clock Face Table for later to save it! 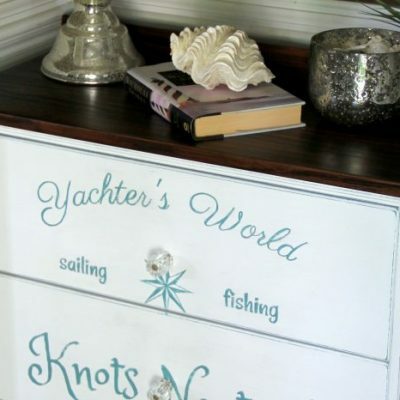 Don’t miss the latest furniture makeover! Absolutely lovely. Very well done! Oh wow!! LOVE this makover!! 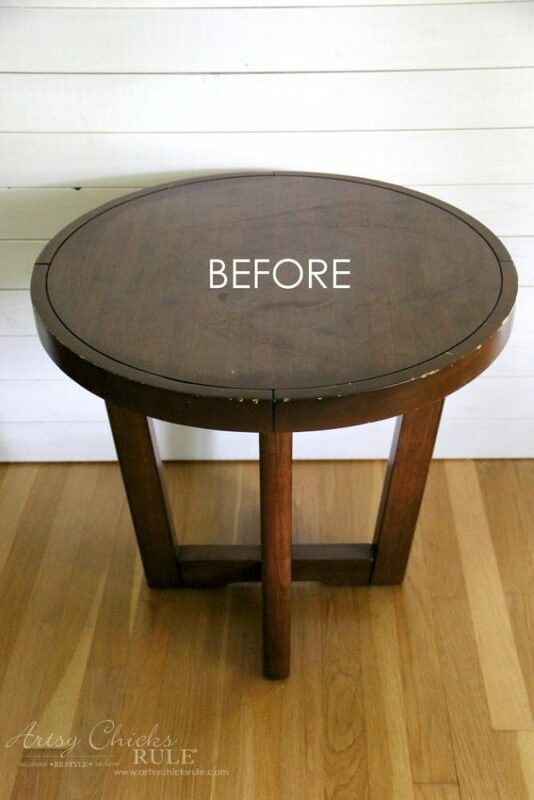 You turned a sad little table into a complete charmer! 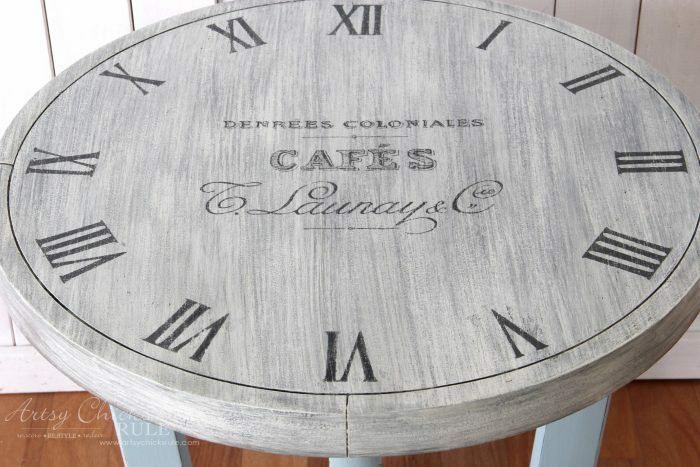 Love the colors and the distressed top with the clock face. GREAT JOB!!! Beautiful job and great tute. Thanks for sharing your vision. Lovely job. 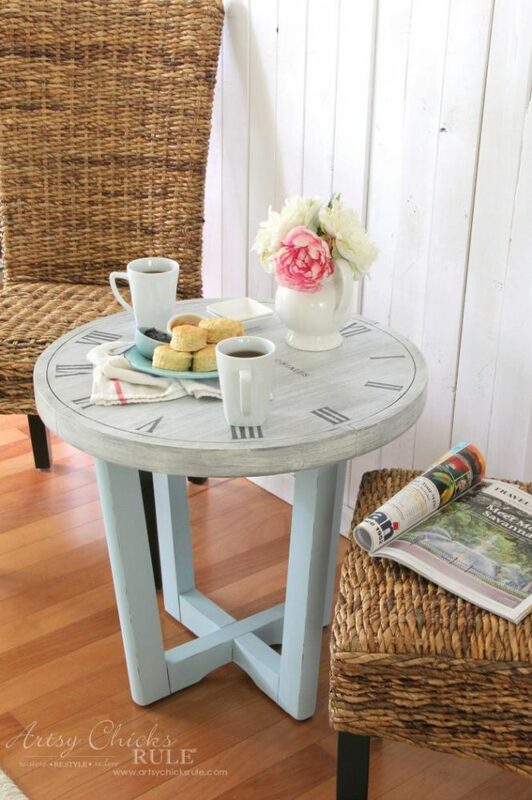 You could go one step further and buy clock workings with hands at a craft store and put a sheet of glass over the table with some risers to make room for the clock parts. But even if you don’t do this, it is so beautiful. You did an outstanding job. 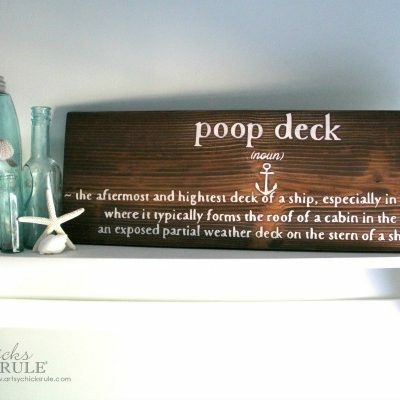 I would love to tr this one myself. Do you have a video of how you use a script liner to fill in the letters? Yours always look so perfect. I can’t seem to get mine to look good at all. Always looks like an art piece in a preschool when I’m done with mine. Nancy, you’ve done it again! What a transformation! Great job?? You inspire us with your creativity and the down-to-earth projects that inspire us. 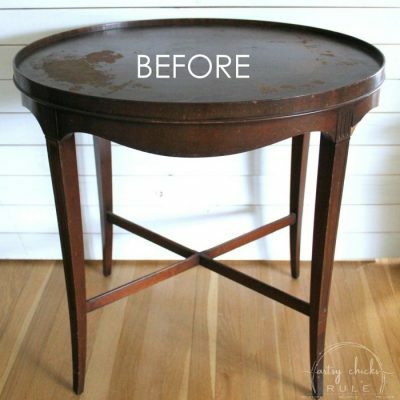 It’s amazing that you create beautiful, affordable makeovers that don’t end up costing hundreds for supplies. Thank you for sharing your talent & passion with us. Love the piece and love your guide and pic procession. 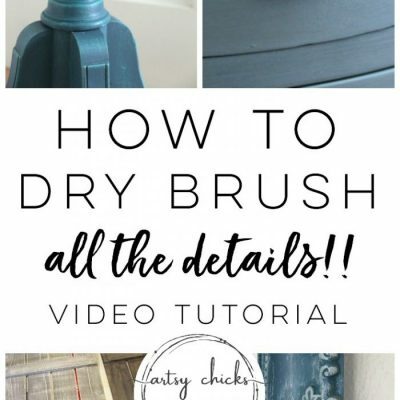 What kind of brush are you using for the layers and for the stencil? This is adorable!!! Probably on my top 5 list of your items! 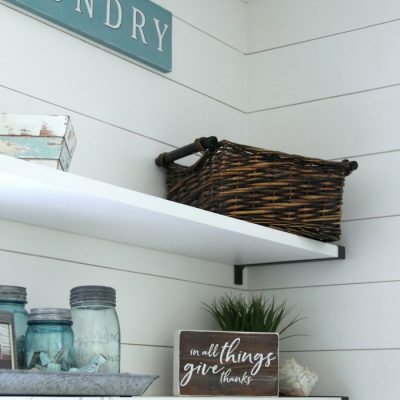 Question for you… to achieve that look, did it really seem necessary to use the brown paint, or could you have just used two colors and layer them? In the pics, I can only really see the two colors. But, I’m thinking for ‘depth’ you may need to use the five colors? Amazing! Amazing! Amazing! 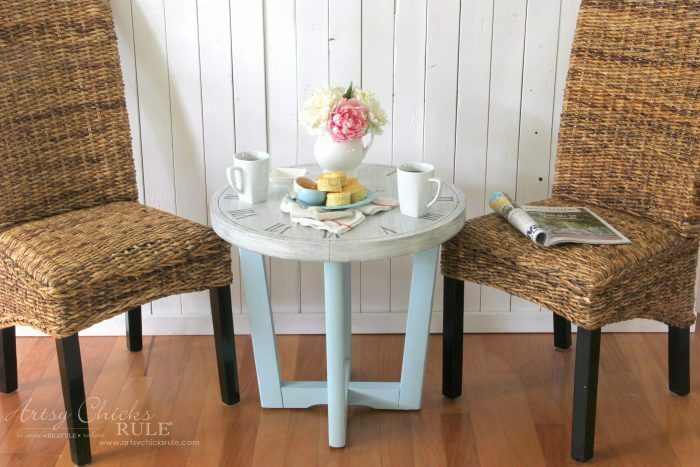 Are the wicker chairs from pottery barn?